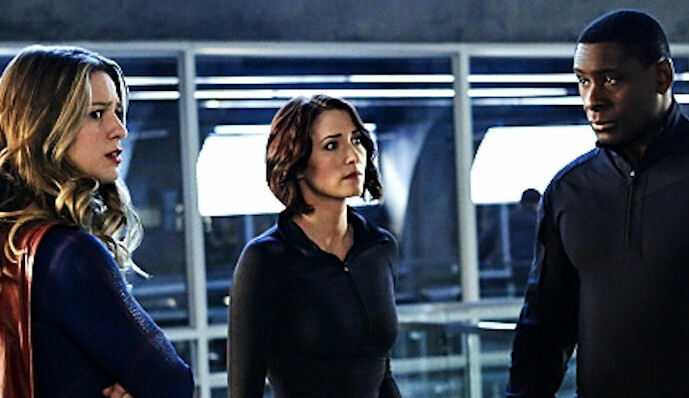 The CW’s much anticipated superhero crossover week kicked off on Monday with Supergirl tying off her loose plot threads before heading out of the universe for a few days. Without the shackles of a new series to launch and an independent story, this year’s crossover looks like it’s going to be fun and accessible for fans and non-fans of Supergirl, The Flash, Arrow and Legends of Tomorrow. With a quarter of the crossover complete, it may still yet be all those things, but writing the most insider Supergirl episode ever seems like a curious entry point for a device designed to draw fresh eyes to all the CW superhero shows. This not to say this was a bad episode; it was quite good. However, “Medusa” did feel like it was in a rush to tie up a lot of loose plot threads before Kara leaves town, so there wasn’t a lot of time to explore some of the ideas introduced in the episode. Chief among them was Kara’s realization that her birth parents were responsible for the creation of a genocidal virus designed to protect Krypton from alien invasion, and was now begin used by Cadmus and Mama Luthor to kill all the aliens in National City. But there was a day to save and a Daxumite boy to kiss, so not really much time for deep meditations on the ramifications of weapons of mass destruction. In what has been a hallmark of Supergirl this year, any issues with plot are more than counterbalanced by the character work that’s being done. Even if it was in a hurry. The Alex coming out story came full circle with a boozy almost-outing at the Thanksgiving table before Alex and her mom have a touching moment together. Her mother’s acceptance and embrace of her being gay liberates Alex in a way that gives her a new confidence, and she says as much to Maggie. That talk and brush with death makes Maggie realize that pursuing a relationship with Alex is a good thing. The tidying continued that way throughout the whole episode. Martian Manhunter turning into a White Martian? Cured by episode end. Is Lena Luthor evil as her mother? Nope! She double-crosses mommy and foils Cadmus’ genocidal plot. Are Mon-El and Kara going to get together now that they’ve kissed? Probably, but they need some more time to flirt. Will we put Winn and James’ vigilante hijinks to bed? Well, you can win them all. The crossover officially kicked off when Barry and Cisco portal in to Kara’s apartment at the end of the hour. The Flash needs a world-saving favor from Kara, and she’s too happy to oblige.